Country music, an original American artform, has been around since before the recording industry began and long before a singer even had the opportunity to sing into a microphone. From the early beginnings in the hills of Appalachia, to the rise of Hank Williams, Patsy Cline, and the more recent megastars, including Garth Brooks and Carrie Underwood, country music has proven to have staying power. It is one of the most popular styles of music in the world today, garnering more sales and downloads currently than any other genre. Many talented individuals are aspiring to sing country music and are determined to turn it into a successful career. Because of this growing popularity, there is a need to educate interested singers with information and methods that will give them the best possible chance at either having a career as a artist, working in the industry as a background vocalist or session singer, or simply realizing their potential in country music. 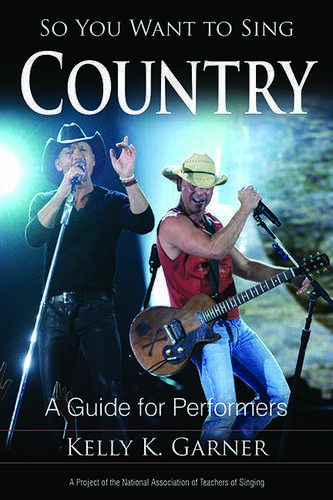 Kelly K. Garner's So You Want To Sing Country is a book devoted to briefly reviewing the rich heritage of country singing and thoroughly examining the techniques and methods of singing in a country style. Additional topics of discussion will include country song types and structure, instrumentation, performing on stage and in the studio, and career options in country music. Additional chapters by Scott McCoy and Wendy LeBorgne, and Matthew Edwards address universal questions of voice science and pedagogy, vocal health, and audio enhancement technology. Kelly K. Garner is assistant professor of commercial voice and teaches country vocal styles, studio singers, vocal ensemble, and performance seminars at Belmont University. She has worked in Nashville for twenty-five years as a session singer, artist, producer, and songwriter.